Weather permitting, work on the 2018 Street Improvements is scheduled to begin on Monday, September 24, 2018. This work consists of milling of the existing asphalt, overlay of a new asphalt surface and installation of traffic pavement marking. The milling operation will start in Countryside Addition beginning at the north end and moving south. Once the streets in this addition are completed, the contractor will move to West Quincy Street. New asphalt pavement and traffic pavement marking will be installed once the milling is completed. Motorists should expect possible changes to traffic patterns and traffic delays during construction. Even though traffic control will be in place to allow traffic to use all the streets in the area of construction, traffic will be slowed due to lane closures. Side streets could also be temporarily closed as the pavement operation moves through the intersections. Motorists are encouraged to seek alternate routes when possible, to use extreme caution when traveling in the area of construction, and be aware of workers in the work zone. The City of Pittsburg appreciates the patience of motorists and residents while this work is being performed. 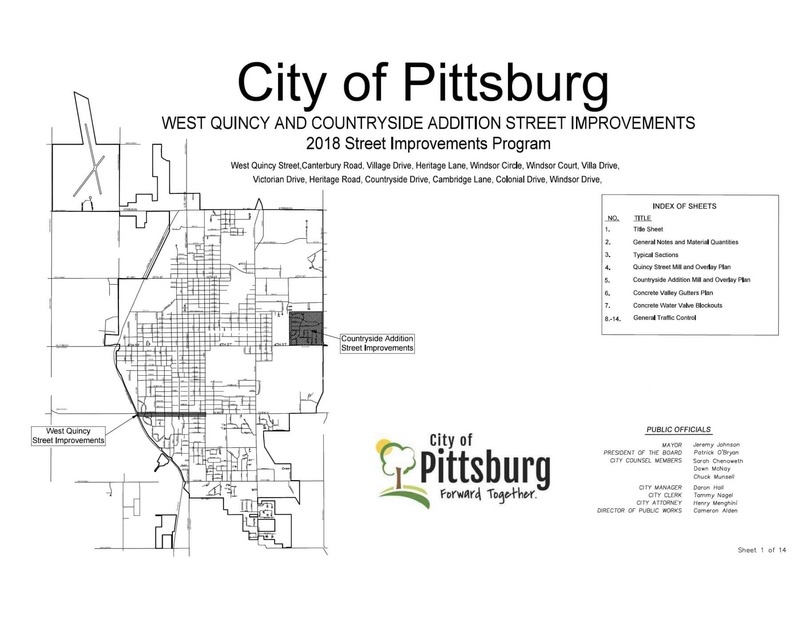 Please contact the City of Pittsburg Public Works Department at (620) 231-4170 with questions regarding this project.